Take a tour of the official residence of the Canadian monarch and their representative at Rideau Hall. Dubbed "Canada's House," this National Historic Site holds both cultural and architectural importance. As you explore some of the residence's 175 rooms, a knowledgeable guide will take you through the history of the monarchy in the country, including the role kings and queens have played in governance. Growing out from a villa constructed in 1838, the building has served its current purpose since 1867, with many of the rooms used for state affairs. 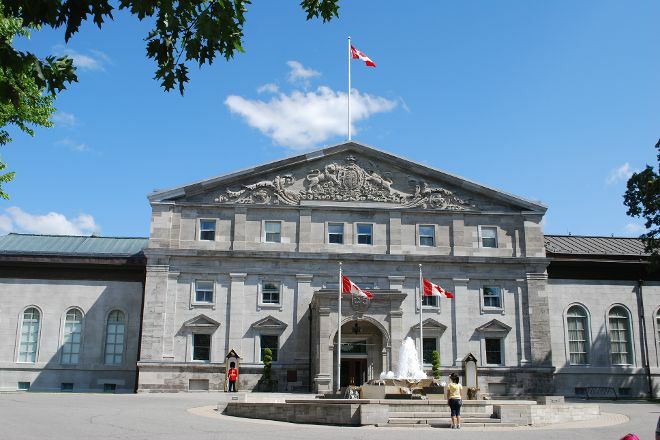 With our international travel planner, Ottawa attractions like Rideau Hall can be center stage of your vacation plans, and you can find out about other attractions like it, unlike it, near it, and miles away. Canadian Generalguvenörens Residence in Ottawa. They have free guided tours every weekend in English or French. I Recommend that you call before O book. No particularly remarkable accommodation though. You get To See the official parts and hear a little about Canada's history. The Tour takes approximately 45 minutes. The House is located in a large park a little outside the centre of Ottawa. You can take bus 9 there. In Winter There is a llten rink for skating. Clean and Comfortable. This place impressed me the most because of their huge gardens and green fields, beautifully kept and organized. I could imagine my weekend walks in this area after a long stressful work week, because the place is extremely quiet and relaxing. All this in the middle of the city. Great place to visit. Beautiful gardens. You are welcome with the guards. The governor resident tour is good too. You see different portraits of paintings of all Canadian governors. The tour is about an hour long. Also many of the medals made for different governors. It is very relaxing having a walk in the park. Very nice garden. Many trees. It was a very good idea to ask presidents and prime ministers visiting Canada to plant a tree. It is very interesting to see who planted each tree and the year. Rideau Hall hosts a ton of events throughout the year. My favourite is the winter festival which had live music and dance, tobogganing, skating, and kiosks from many countries around the world that often gave out delicious local treats. I loved the raclette! There is a huge, yet adorable greenhouse full of interesting little surprises. The hall itself houses many works of art including many portraits. Surrounding the hall there are lovely outdoor gardens that make for a nice walk. My sister received The Order of Canada, bestowed by the Governor General, here, at the official residence. My husband and I were among a few select guests at this auspicious occasion. At he reception following, we took see-tours of public rooms, where guides stood answering questionds and providing information about the sumptuous rooms. What a thrillling day! Every day, we help thousands of travelers plan great vacations. Here are some tips on how to use your Listing Page to attract more travelers to your business - Rideau Hall. Promote your permanent link - https://www.inspirock.com/canada/ottawa/rideau-hall-a95908469 - on your website, your blog, and social media. When a traveler builds a plan from this page, the itinerary automatically includes Rideau Hall. This is a great way for travelers looking for a great vacation in your city or country to also experience Rideau Hall. Promoting your link also lets your audience know that you are featured on a rapidly growing travel site. In addition, the more this page is used, the more we will promote Rideau Hall to other Inspirock users. For best results, use the customized Trip Planning Widget for Rideau Hall on your website. It has all the advantages mentioned above, plus users to your site can conveniently access it directly on your site. Visitors to your site will appreciate you offering them help with planning their vacation. Setting this up takes just a few minutes - Click here for instructions.